Passers-by lit memorial candles and inspected the phone and bus stop where the attack took place. By evening, traffic flowed like normal. By Wednesday evening the rain-slicked streets of Jerusalem felt almost like normal, with traffic flowing as if nothing had happened that afternoon. At the busy bus stop in-between the Jerusalem Central Bus Station and Binyanei HaUmah (Jerusalem International Convention Center), passers-by inspect the charred public phone where the nondescript package was placed. The phone still hangs off the hook, and two memorial candles sit nearby for the British tourist who was killed and the approximately 50 people who were wounded. A stranger re-lights one candle that has gone out. The bus #74 line was running normally through downtown Jerusalem when it suffered a large hole in the side by the bomb's force. Passers-by inspect the public phone where the bomb, disguised as a normal bag, was placed. The "Pitzutz Shel Kiosk" (Blast of a Kiosk) stand, where sandwiches and drinks are sold. It received its name after suffering a previous terrorist attack in the same place in 1994. The owner Shimshon Moshe and his brother-in-law David Amuyav called the police when they saw the suspicious package and called for people to get out of the way seconds before it exploded. The phone on the other side of the stand still dangles off the hook as people look to see where the bombing happened. The clear plastic canopy over the phone has been blown off. The police "Do Not Cross" tape has been taken down and the blood has been cleaned up as people wait for the bus at the same stop where the attack occurred. 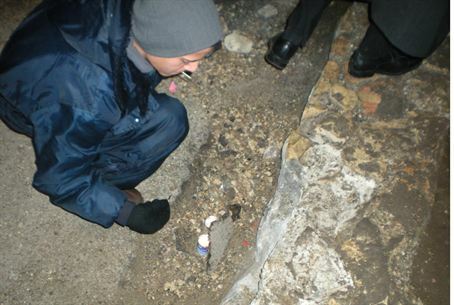 A young man re-lights one of the memorial candles placed next to the bombing site that has gone out in the rainy evening. On Friday morning, flowers were placed at the attack site, one from the Jerusalem municipality and one with the words, "on behalf of the British government," placed by diplomats in memory of Mary Jane Gardner, the Hebrew University student from England who was killed in the explosion. A memorial candle sits on top of the brand new public phone that has replaced the one damaged in the blast. The Pituitz Shel Kiosk was still closed as of Friday. Barbed wire surrounded the back. The multiple bus stops were as crowded as ever. Photos by Ben Bresky, Israel National News.